Arch rock viewed from the top. Notice bikes parked on the left at the road below. Even these folks! 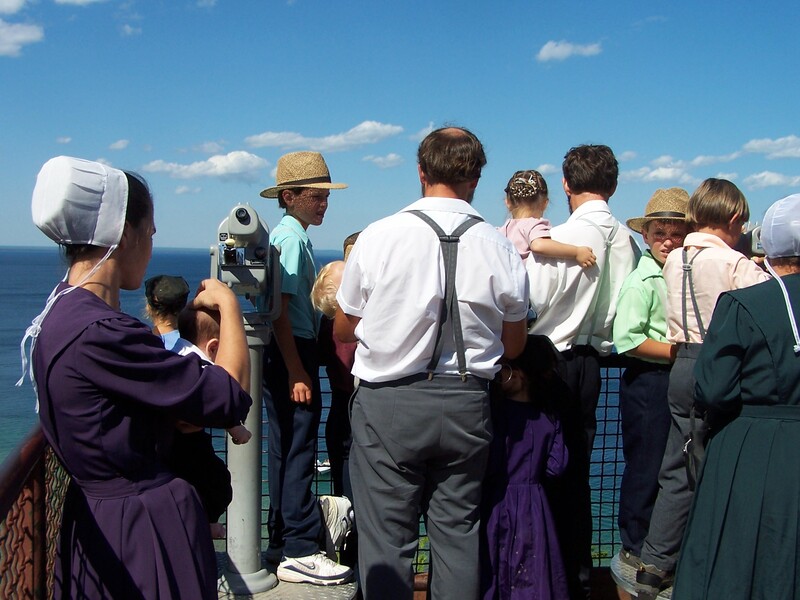 Amish visitors at Arch Rock. want to hire a carriage ride, bike or walk up one of the steep hills, or climb an arduous set of stairs from the road below, you can always just stop on the road and look up, up, up. Of course you’ll miss the fantastic views you’d see had you gone up to the top. 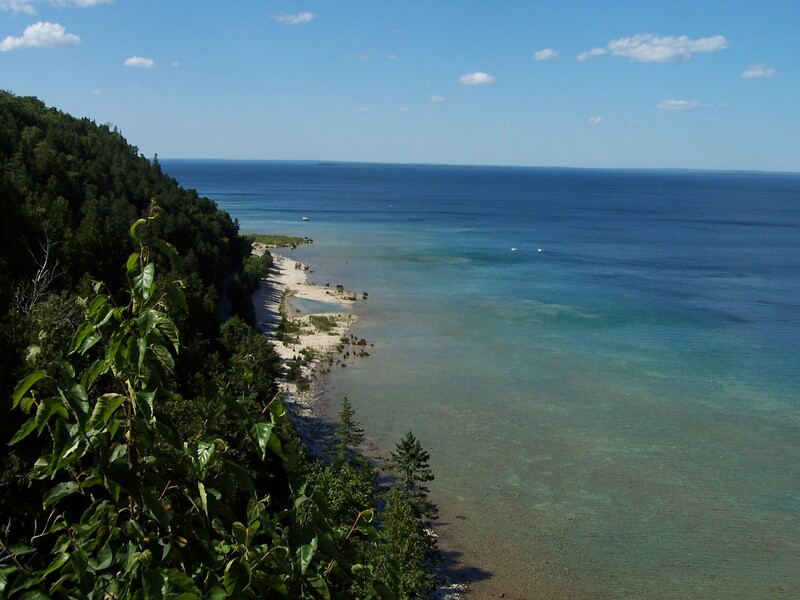 Lake Huron shoreline seen from Arch Rock. 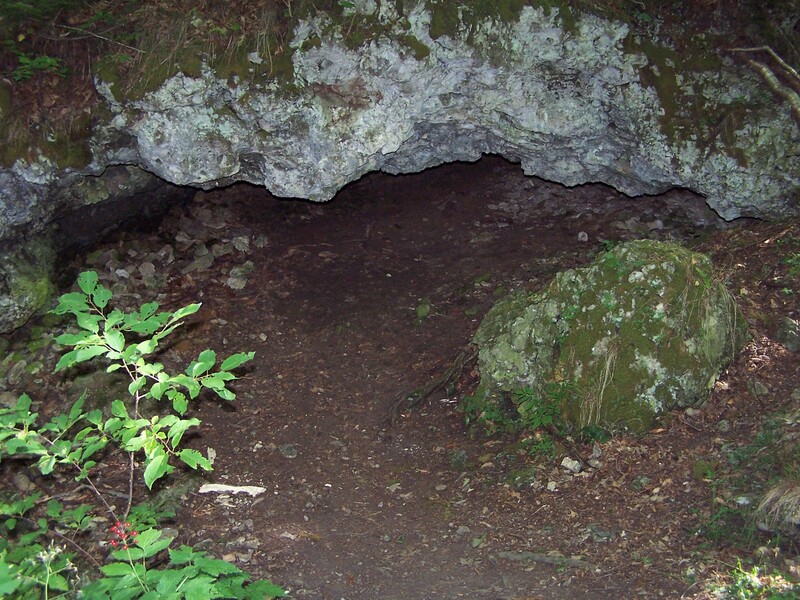 Cave of the woods - tall enough to sit inside. 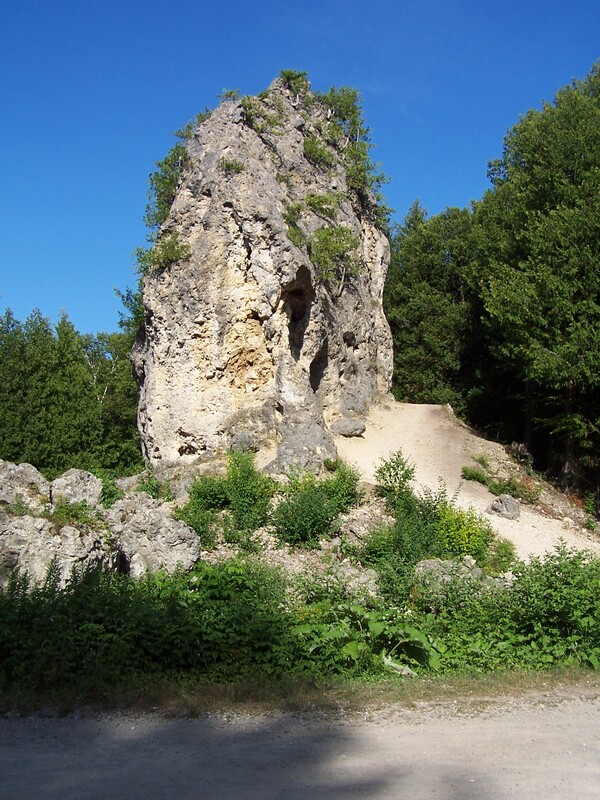 But the biggest, baddest rock formation at Mackinac Island is Sugar Loaf Rock. Located at the highest part of the island, Sugar Loaf is a dramatic breccia mass rising 75 feet above the ground, and is the island’s largest limestone stack. A bike ride or long walk will get you up the hill to this highest point to see it. But be sure to bring your map – there’s no crowds up there to lead the way. 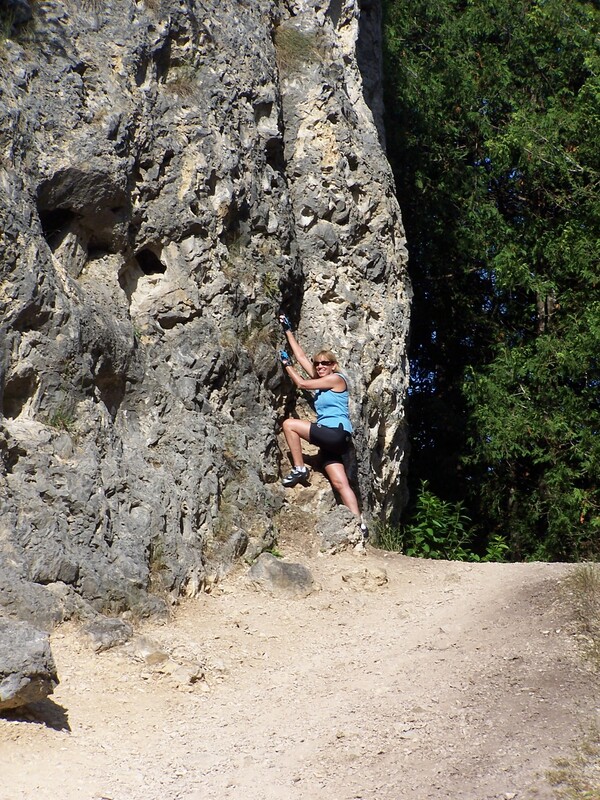 Hey Huffygirl, no climbing allowed! 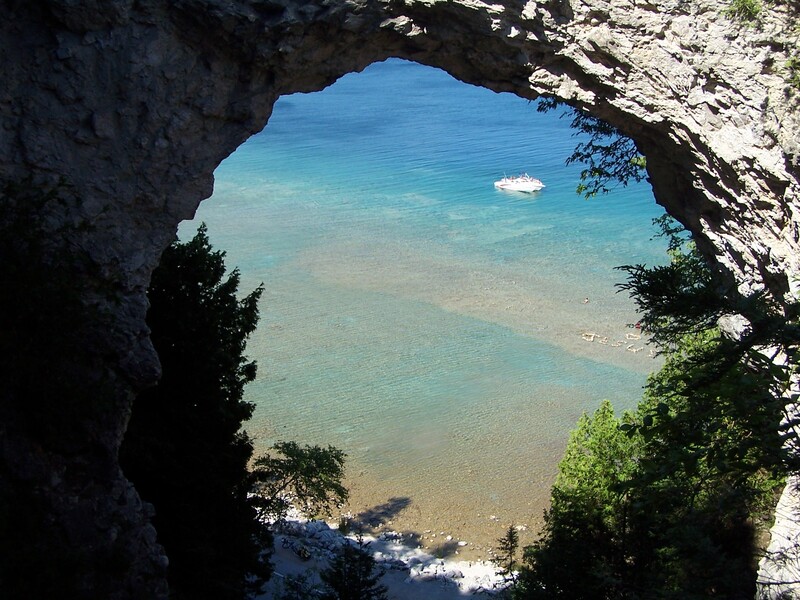 This entry was posted in Nature, Photos and tagged Arch Rock, Mackinac Island, nature, photos, postaweek2011, rocks of Mackinac Island, Sugar Loaf, vacation by Huffygirl. Bookmark the permalink. I forgot how much I like Mackinac! Haven’t been there in 30 years. It is exponentially more crowded than it was when we visited as kids. Everytime we’re there we curse the hapless tourists who stop biking in the middle of the road without warning, or leave their bikes PARKED in the middle of the road, yet we still love it and keep going back. I had the good fortune of attending the internal medicine conference there, so we can mix business with pleasure. Great pics here and in the first post. Thanks Ann. There will be a few more over the next few days. There is a minor league team in Grand Rapids, the White Caps, I think. That is about 3 1/2 hours south of the bridge, where you get the ferry to Mackinac Island. Would that work? Then of course there is our major league team, the Detroit Tigers – probably 4+ hours from the bridge. What will you see if we take a carriage? The carriage tours take you to all the prominent sites – Arch Rock, Grand Hotel, the Fort, and through downtown.